Sarah McKinney having a diva moment as Lucy. Dickens has Fagin and his band of pickpockets. Brecht has Mr. Peachum and his army of beggars. London's Victorian underworld in Brecht and Weill's Threepenny Opera is a lot like the London of Oliver Twist, but with considerably more blurred moral boundaries. In Mr. Peachum's world, the main competition in the business of self-enrichment is one "Captain" Macheath (aka Mack the Knife), London's most notorious criminal, who also happens to be close friends with the chief of police. This might seem to give Mack an unfair edge, particularly after he marries Polly, Peachum's only daughter. But factor in the number of women Mack has "married" in the past and the deviousness of Mrs Peachum, and the advantage is less clear. How important is loyalty? How expensive is revenge? And how easily could 400 beggar boys bearing placards touting biblical platitudes wreck a Queen's coronation parade? Only time and bargaining skills will tell. Described as a "play with music," this collaborative production between the Arcata Playhouse and Ferndale Repertory Theatre takes the proposition one step further by staging it with "actors as musicians". As anyone familiar with both venues can attest, the Playhouse stage area is significantly smaller than Ferndale's, posing practical challenges to both the production team and the performers. Co-producers Leira Satlof and David Ferney, along with Technical Director Raymond Gutierrez, have risen ably and imaginatively to the occasion by incorporating the orchestra into the multilayered ramped and cantilevered set to fit everything into the available space. The set will likely be roomier on the Ferndale stage, where it will move mid-month, but I hope the producers can retain the audience interactivity that adds to the fun of the Playhouse production. The need for performers who can act, sing and play a musical instrument or two is challenging for any theatrical producer, but this was not the case for Satlof and Ferney, who have put together a terrific cast from Humboldt County's pool of artists. Every cast member successfully navigated the set and the instruments without once colliding or tripping — which speaks volumes for the performers' control and timing. Christopher Kehoe (Macheath) is a commanding presence, physically, vocally and dramatically, as he woos and wheedles his way around the city. Carl McGahan as Peachum is the perfect foil, with his subtle intimidation and machinations, and Diane Zuleger is masterful (or should that be mistressful?) as the distinctly unsubtle Mrs. Peachum. Added bonus: Both Peachums also blow a mean saxophone. 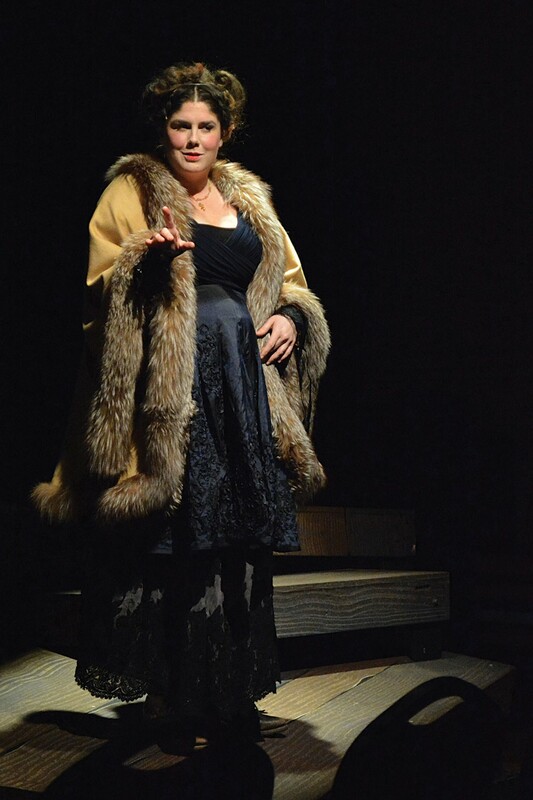 Kaitlen Osburn brings a powerful voice to Polly Peachum and proves a more than equal match for Mack's wiles, as well as her father's threats. The Greek chorus of Mack's lady friends is led by the Playhouse's own Jacqueline Dandeneau as sad, conniving, bribable Jenny, and Sarah McKinney in a wonderfully diva-esque turn as the pregnant Lucy who still hopes that Mack will make an honest woman of her. These two are well supported by Jill Petricca (who doubles as music director for the entire show), Gina Piazza, Laura Welch and Cindie Barr. Macheath, too, has his own Greek chorus – a trio of lowlifes with the wonderfully Dickensian names of Readymoney Matt (Jim Case), Crookfinger Jake (John Petricca), and Walt Dreary (Perrin Turney). The three aptly perform a flat — one might even say dreary — and very unmusical ("yay," "hooray") chorus at Mack's wedding to Polly. Rounding out the exceptionally well-matched cast are Ethan Frank as would-be beggar Filch and a hapless police constable, and Rigel Schmitt as beggar-boy Twitcher and the Scottish priest who marries Mack and Polly. Cindie Barr and Perrin Turney do double duty as Peachum's blind and giggling beggars, respectively. The action of the play is moved forward for the audience by two other devices creatively repurposed from the world of traditional opera. The street singer (Andrea Zvaleko) introduces and closes the show with two radically different interpretations of the eponymous "Mack the Knife," and each scene is described with hand-cranked supertitles that creak above the set. Lynnie Horrigan's costumes are, as always, right on the money. The fox furs and faded velvets perfectly convey the aspirations of the ladies, the gentlemen are clearly striving for at least outward respectability, and the beggar boys are just raggedy enough to be sympathetic. The same goes for Michael Foster's lighting — subtle where it needs to be, yet always appropriate for the moment. Dillon Savage keeps the sound balanced throughout, which is not always an easy task in the low-ceilinged Playhouse. It seems somehow appropriate to be watching a sardonic take on morality and poverty in election season. I can't help wondering how some of today's presidential candidates might deal with the ethics versus hunger dichotomy, not to mention the somewhat rhetorical question of whether it's better to engage in blatant thievery or banking. Das Barbecu plays at North Coast Repertory Theatre Fridays and Saturdays at 8 p.m., and Sundays at 2 p.m. through Feb. 20, with a Thursday showing at 8 p.m. on Feb. 18. This ambitious Texan send-up of Wagner's Ring cycle has some good camp and solid comedic performances, but the script, hog tied to the original opera, falls short. Call 442-6278 or visit www.ncrt.net. Outside Mullingar, an emotional and comic tale of late love in rural Ireland, begins with a preview performance at Redwood Curtain Theatre on Feb. 25 and runs through March 19 with 8 p.m. performances Fridays and Saturdays and a 2 p.m. show on Sunday, March 13. Call 443-7688 or visit www.redwoodcurtain.com.